Binoculars can be a phenomenal tool to have at your disposal; there’s a reason as to why people own them. Though you might be in a position to where you need something to enhance your long distance vision, you might not be interested in lugging around hefty equipment when you’re heading to your hunting ground. This is when the best compact binoculars for hunting come into play and finding the right ones can be easy. Below, we will explore five of the best compact binoculars on the market for hunting. When it comes to hunting binoculars, Bushnell is a relatively well-known brand as their models are designed to withstand an ample amount of wear and tear. The Bushnell PowerView Compact Binoculars help to make spotting targets at a distance easier with their simple focus system, multicoated optics, and more. Plus, they come equipped with a rugged housing to ensure that your binoculars won’t be damaged, even after dropping them from a relatively high distance. When it comes to choosing the best binoculars for hunting, the first thing to think about is the optics. 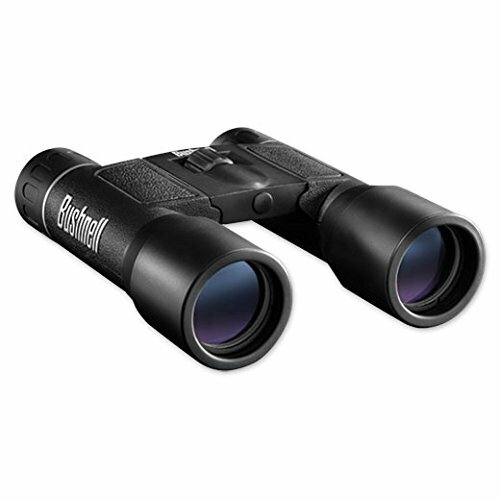 The Bushnell PowerView Compact Binoculars offer roof-prism optics that are coated with multiple layers of blue and green film in an effort to achieve optimal brightness and transmission of light. This helps to make your vision clearer, allowing you to see faraway targets as if you were looking at them up close. 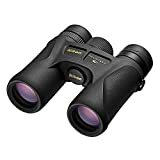 Another phenomenal feature integrated into these binoculars is their body armor, which is designed to keep your binoculars safe while hunting and traveling. The non-slip rubber protection is essential for use in different temperatures and gives you the firm grip you need to keep the binoculars steady when held against your face. In addition, the rubber helps to absorb shock from drops, protecting the casing and lenses. The main feature that is missing from the Bushnell’s that would easily catapult them to the top of the list is water and fog resistance. Without these two, it will be relatively impossible to use them in different types of weather, particularly in wet and humid conditions. If you’ve been searching for compact binoculars without having to compromise clarity, the G4Free Compact Binoculars are a great option to choose. They boast an incredible number of features that help to make them one of the best hunting binocular models on the market, ranging from XMC BAK4 prism optics to lowlight vision. Not to mention, they’re also incredibly versatile due to their size, making them perfect for everything from hunting to sailing. What you might find to be the most interesting about the G4Free Compact Binoculars is they are designed to enhance your vision in low-light situations, though they don’t offer 100% night vision. The HD high-powered optics are essential for gathering the perfect amount of light, so you have the clarity you need when focusing on targets during the day without the worry of losing contrast or color. You’ll also appreciate the included accessories that come with the kit such as the high-end carrying pouch (for safe transport), a hand strap (essential for preventing drops), and a cleaning cloth to keep your eyepieces and objective lenses as clean as possible. You’ll also want to take note of the water-resistant housing that helps to protect the binoculars against light rain, (though it’s not recommended to submerge them in water), and the hand figured polishing adds a striking military appeal to their design. One concern with the G4Free Compact Binoculars is their lack of rugged body armor, which will help to absorb shock if they end up being dropped. This is why they’re typically not recommended for the more clumsy hunters. 12x magnification with 25 mm objective lens. HD high-powered binoculars. It has a range of 273 feet at 1000 yards. XMC Technology with BAK4 prism which can 100% reflect the light to keep a good image (while don't forget to adjust the knobs to fit different view distance). The binoculars is made of Mg body and hand figured polishing. Suitable for both adults and kids, fit for hunting, hiking, exploring, viewing, sailing, bird watching, concert, outdoor sports etc. Bonus accessories includes hand strap, carrying pouch and cleaning cloth. As a hunter, you’re going to need a pair of binoculars that can give you an edge on your targets. The USCAMEL Compact Binoculars are designed not only to be easy to use but to also give you a clear image of the potential game that you could be searching for at far distances. Their construction is impressive, giving you the durability you’ve always desired from your hunting gear. Additionally, their optics also impress with the perfect amount of brightness and clarity to track your targets. One of the best features integrated into the USCAMEL Compact Binoculars is the diopter adjustment that is located on the right eyepiece. This gives you the ability to adjust your vision in both your left and right eyes, so you can have optimal viewing quality with little to no hassle. You’ll also love the dielectric and phase coatings on the objective lenses which help to filter the perfect amount of light, so you can achieve the best contrast levels possible with little to no color aberration. 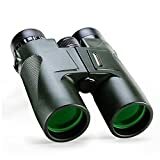 The feel of the binoculars is another huge selling point, as they are compact and lightweight, but still carry an ample number components such as the magnesium alloy body. You’ll truly feel their durability every time you pick them up, and they are entirely fog proof, helping to prevent dust, debris, and any type of moisture from getting inside of the binoculars. When it comes to prestige, the Nikon Prostaff 7S Binoculars are surely the crème de la crème of vision enhancement products. They truly outperform the competition due to their high manufacturing standards. Adaptable to any size face and individuals who wear glasses (or not), you’ll finally have the ability to take advantage of a pair of binoculars to make hunting simpler and more enjoyable. There are plenty of phenomenal features included in this model, ranging from rubber eyecups to ergonomic grips. First, the Nikon Prostaff 7S Binoculars offer plenty of adjustable features, including the focus and the positioning of the eyecups. It’s impossible to create a single eyepiece design that will accommodate everyone’s face, and as such, you can take advantage of the turn-and-slide function on the eyecups. This will allow you to customize the space between each eye and its corresponding eyepiece for the best field of view possible. The build quality of the Nikon Prostaff 7S Binoculars is also a feature that should be discussed, as it sets them apart from the competition. The rugged and reliable shock absorbent body armor not only helps protect the binoculars if they are dropped, but also gives you optimal grip when you’re using them in wet conditions. In addition, the binoculars are filled with nitrogen and sealed with an O-ring to offer complete fog and water protection. When it comes to the quality of the optics, you’ll surely appreciate the high definition and high-resolution images that are shown back to you, even at the furthest distances. The phase-correction coated roof prisms offer the highest quality viewing experience possible, allowing the perfect amount of light to be transmitted through the lenses so you have a natural and clear view of your targets. 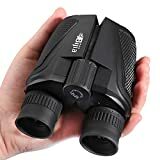 Although they don’t boast as many features as the other binoculars on this list, they do exactly as advertised, and give you a phenomenal way to view targets at a distance. With impressive optics, it’s easy to see why they’re one of the best compact binoculars for hunting. If there’s one thing that can certainly be said about the Carson VP Binoculars, it’s that they take their water and fog proofing seriously. There’s no need to worry about using these binoculars in poor weather conditions or even in extremely high or low temperatures. You’ll have access to clear and crisp images, no matter where you are either indoors or outdoors. Also, the extra-long eye relief is essential for users that have to wear glasses as well as use binoculars while hunting. 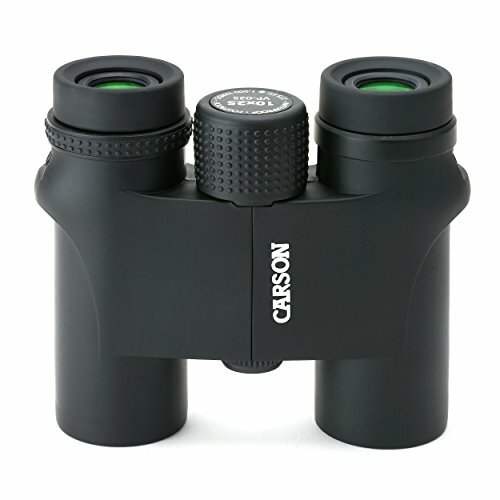 Unlike other binoculars on the market, the Carson VP Binoculars have twist-down eyecups with an extra-long eye relief that will help them fit perfectly against your glasses or your face. Another interesting feature is its waterproof body, which is quite similar to the high-end hunting binoculars on this list. Filled with nitrogen and sealed with an O-ring, these binoculars are 100% fog and waterproof. Dimensions (LxWxH): 4.25'' x 4.25'' x 1.5'' | BAK-4 Prisms | Weight: 0.85 lbs. At the end of the day, you’re going to be faced with plenty of decisions when it comes to finding the right hunting binoculars as every outdoorsman has their own preferences. If you’re interested in choosing a top-tier brand that has multiple reports of success, durability, and long-lasting clear optics, you’re going to want to side with the Nikon Prostaff 7S Binoculars for three main reasons. There’s nothing worse than spending money on a pair of binoculars that will break as soon as they are dropped once, but with the Nikon Prostaff 7S’ you won’t have to worry about damage. They are designed to withstand an ample amount of pressure, and with the help of their shock absorbent ergonomic body armor and grips, you have complete control over the resilience of your device. Another important thing to consider is weather resistance, especially when it comes to hunting. The Nikon binoculars outperform the other competing brands on this list because they are designed to withstand not only dust and debris but also water and other forms of moisture. You can easily use them in any temperature and you’ll never have to worry about water logging thanks to the nitrogen filled and the O-ring sealed interior. When you’re looking for binoculars you need to think of the clarity of their optics. 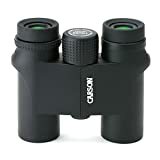 Nikon, a renowned camera manufacturer, takes pride in their products’ optic clarity and as a result, the same manufacturing has gone into their binoculars. If you’re searching for pristine images that are clearer than you could imagine, these are certainly the perfect pair for you. Hunting without binoculars and scopes can be akin to firing blindly into a field, and with the help of the right binoculars, you can track your target and meet your mark with every shot.